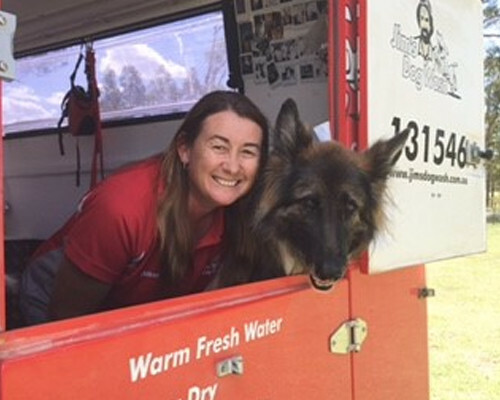 Hi I’m Anne of Traralgon Nth, I have lived in Gippsland all my life and I have been working with dogs for over 5 years. I thought it was time to obtain qualifications to support my passion of working with dogs and I just love my job! I have a German Shepherd named Bella that is very much a part of our family business. I am a member of the German Shepherd Club of Victoria Gippsland branch (GSDCV), where Bella has gained her endurance title. I am also an accredited Obedience Instructor with GSDCV. My passion is the German Shepard Dog and to promote them positively as the beautiful intelligent breed that they are. It is great to get to the stage in my life where I do what I love, and this is it for me! 131 546 or request a free quote online to arrange for a Anne to get in touch with you. We wash dog at your home or office, a place your dog knows and is comfortable in.